Every person engaged or intending to engage in any calling, business, occupation or profession, in whole or in part of, within the limits of the Town of Irmo, South Carolina, is required to pay an annual license tax for the privilege of doing business and obtain a business license. This includes those businesses located outside the Town of Irmo who conduct business within the municipal limits of Irmo. Before conducting business in the Town of Irmo, feel free to contact our Business License Clerk with any questions or assistance with obtaining a business license. For more information, you may access the Irmo Business License Ordinance. If you are a new business in the Town of Irmo, or have a change in ownership, you will first need to submit a Zoning Permit Application. Once the Zoning Permit is approved, the next step will be a Fire/Safety Inspection conducted by the Irmo Fire Marshal. Upon approval from the Fire Marshal, a Business License can be obtained. 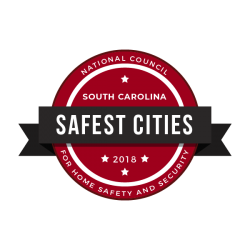 The Town of Irmo uses the North American Industry Classification System (NAICS) to classify business establishments based on the type of work being performed by that business. The six-digit (NAICS) code used on the application should match the NAICS code on your Federal Tax Return if you are a Resident Business. Businesses located within the municipal limits of Irmo may be required to submit IRS tax documents each year showing gross receipts for the calculation of their business license. All licensed contractors must purchase a vehicle decal for each service vehicle at the job site. The cost is $3.00 per vehicle decal. Renewals are due no later than April 15 in order to avoid penalty. After April 15, a 5% penalty per month will be assessed. Do I need a business license even if I have a state license? Yes. If you are deriving income from any job located with-in the town limits of Irmo or if your business is located with-in Irmo town limits you must obtain a business license from the Town of Irmo. Can I renew my business license on-line? No. Not at this time; you can either mail it in or come to the Town Hall. It depends on the type of business activity, rate classification, whether your business is located inside or outside of the Town limits, and the business’s gross receipts. If this is the first time your business has applied for a license in the Town of Irmo, please call (803) 781-7050 for assistance in classifying your business type. IN ORDER TO ENSURE PROPER CREDIT TO YOUR ACCOUNT, YOU MUST RETURN THIS COMPLETED APPLICATION. I/WE DO HEREBY CERTIFY THAT THE AMOUNT RETURNED AS TOTAL GROSS FROM BUSINESS OR PROFESSION AS REPORTED HEREIN IS TRUE AND CORRECT, AND THAT I HAVE MADE NO DEDUCTION FOR “DROP SHIPMENTS”, “SALES TO GOVERNMENT AGENCIES”, “OUT OF CITY OR COUNTY DELIVERIES”, OR OTHERWISE, AND THAT I AM FAMILIAR WITH CITY ORDINANCE PROVIDING FOR PENALTIES AND REVOCATION OF MY (OUR) LICENSE. I/WE DO HEREBY CERTIFY THAT ALL PERSONAL PROPERTY TAXES HAVE BEEN PAID WHICH ARE DUE AND PAYABLE TO THE TOWN OF IRMO AS OF THIS DATE AND THAT THE BUSINESS NAME REPORTED ON MY SOUTH CAROLINA INCOME TAX RETURN. The Town works to administer Town Planning and Development through the adoption of a comprehensive plan, zoning ordinance, and land development regulations which provide for harmonious, orderly and progressive growth, informed decisions on land use decisions, and help prepare for future development and maintain and enhance the current quality of life that makes Irmo such a distinct and desirable community in which to live. We pride ourselves in partnering with the people and businesses who invest in our community. The ultimate goal of the Comprehensive Plan is to establish a set of guidelines and procedures that will serve as a tool for making informed decisions about land development, economic growth, infrastructure improvements, housing and transportation needs, and protecting natural and cultural resources. State Law requires that the plan be re-evaluated every five years to reflect changes in growth or direction of development and the Irmo Planning Commission must prepare and recommend a new plan every 10 years. The Zoning Department ensures compliance to the Town of Irmo Zoning Ordinance. The Zoning Clerk reviews zoning request and schedules public hearings, permits signs, reviews plans to ensure compliance to zoning land use regulations, and enforces all provisions in the Zoning Ordinance. How is this property presently zoned? If this involves a change in the Schedule of District Regulation, what? What new zoning do you propose for this property? If this involves a change in the Zoning Text, what section or sections will be affected? It is understood by the undersigned that while this application will be carefully reviewed and considered, the burden of proving the need for the proposed amendment rests with the applicant. If I am doing a building project and live in Richland County do I need to contact the county or town for a building permit? You would contact the Town of Irmo first for a zoning permit and then all building questions will be referred to Lexington County for permitting and approvals. If I want to put a shed or carport up on my property, what do I need? You would first contact the Town for a zoning permit and you will need a copy of the plat or a drawing that shows all of the setbacks (distances from structures to the edge of your property). If you are using a contractor they would also need a business license. How much is a zoning permit? $25.00 for each permit required. NO SUCH SIGN WITH OR WITHOUT A PERMIT, SHALL BE DISPLAYED FOR A PERIOD EXCEEDING 30 DAYS NOR AGAIN BE DISPLAYED ON THE SAME ESTABLISHMENT MORE THAN THREE TIMES DURING A CALENDAR YEAR. IF LOCATED IN A SHOPPING CENTER, OWNER OF SHOPPING CENTER OR MANAGEMENT COMPANY NEEDS TO GIVE WRITTEN PERMISSION. ONLY 3 BANNERS ARE ALLOWED PER YEAR PER PROPERTY. NO SUCH DISPLAY WITH OR WITHOUT A PERMIT, SHALL BE DISPLAYED FOR A PERIOD EXCEEDING 14 DAYS NOR AGAIN BE DISPLAYED ON THE SAME ESTABLISHMENT MORE THAN THREE TIMES DURING A CALENDAR YEAR. IF LOCATED IN A SHOPPING CENTER, OWNER OF SHOPPING CENTER OR MANAGEMENT COMPANY NEEDS TO COMPLETE OUTDOOR DISPLAY PERMIT. The Zoning Administrator shall certify that the proposed use and construction plans comply with all provisions of the Zoning Ordinance except those for which a variance has been requested. A. There are extraordinary and exceptional conditions pertaining to the particular piece of property. B. These conditions do not generally apply to other property in the vicinity. C. Because of these conditions, the application of the ordinance to the particular piece of property would effectively prohibit or unreasonably restrict the utilization of the property. D. The authorization of a variance will not be of substantial detriment to adjacent property or to the public good, and the character of the district will not be harmed by the granting of the variance. The use and construction as proposed herein complies with the terms of the Zoning Ordinance except for the variances requested. Accepted file types: pdf, doc, docx, jpg, png, pdf. 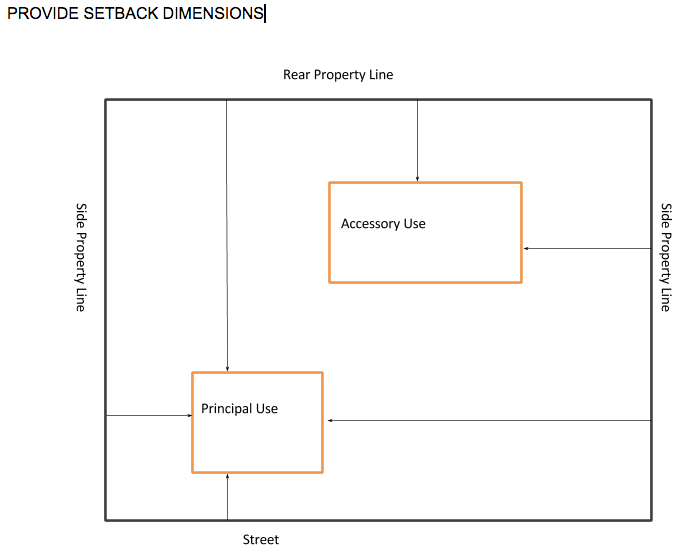 In lieu of Site Plan, applicants for permits involving no more than two occupancy units (Commercial or Residential), may use the following diagram to show the location and setbacks for principal and accessory structures, buffer yards, and accessory structures, buffer yards, and other applicable requirements. I have reviewed the plans as submitted to the Town of Irmo and agree to complete the project as shown in these plans. I further understand that any variations to these plans must be resubmitted and approved by the Town of Irmo. IT IS UNDERSTOOD AND AGREED THAT THE ZONING PERMIT IS ISSUED IN RELIANCE OF ALL INFORMATION AND ON THE SITE PLANS SUBMITTED BY THE OWNER OR AGENT; THEREFORE, IF ANY FALSE OR MISLEADING INFORMATION IS FOUND TO EXIST THEREIN, THE ZONING PERMIT IS VOIDABLE BY THE ZONING ADMINISTRATOR. The Irmo Town Ordinance 12-12 listed below outlines the rental property requirements. Landlords/Owners are required to register each residential rental property and pay a $50 registration fee for each property per year. Mail payments to: The Town of Irmo, P.O. Box 406, Irmo, SC 29063. Any payments received after April 15th will be assessed a late penalty. If you no longer own this property please submit proof that it has been sold. Please remit payment along with this completed form. The cost per rental unit is $50 per year. Payments received after April 15th will be assessed a late penalty fee of five percent per month. Refer to Chapter 11 – Rental Property Registration @ www.townofirmosc.com for more information.